In realizing our country’s Vision 2020 (Wawasan 2020) which has the primary objective of making Malaysia a fully developed country by the year 2020, the government has to take the right action to meet the nation future energy demands. Eventually, the fossil fuels will be exhausted or depleted. Without denying the vast number of other renewable energy sources, our country should also look into more sophisticated technologies to tap these energy sources. Renewable energy sources such as solar, wind, and tidal are proven not so suitable in Malaysia due to its weather and geography. That being said, having nuclear energy for power generation in near future seems inevitable. So, should Malaysia go nuclear to meet its future energy demands? Indeed, this question has been the focus of heated political debate in this country for the past nine years or so. Malaysia’s fourth Prime Minister, Dr. Mahathir Mohamad, was resolutely committed to a non-nuclear country. However, his successors have made some moves toward nuclear energy production since his resignation. For instance, Dato’ Sri Peter Chin Fah Kui, who is the current Minister of Energy, Green Technology & Water, announced plans to build two 1000MW nuclear power plants by the year 2022 during his speech in December 2010. A month later, Dato’ Sri Najib Razak announced the establishment of the Malaysian Nuclear Power Corporation which lead the planning process of nuclear energy in this country. Needless to say that he Fukushima accident has raised doubts whether Malaysia is ready for nuclear power, but however Deputy Prime Minister remained confident that Malaysia would “implement what is the best” for the country and learn from Japan to ensure public safety. The No. 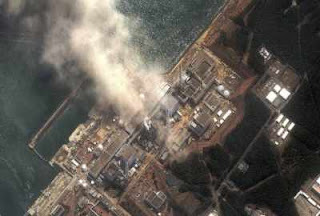 3 nuclear reactor of the Fukushima Daiichi nuclear plant is seen burning after a blast yesterday, March 14, 2011. Muhyiddin said the Malaysian government will learn from Japan to ensure public safety. PUTRAJAYA, March 15 — Malaysia is taking note of the Japan nuclear crisis when implementing its plan to build two nuclear power plants in the future, Deputy Prime Minister Tan Sri Muhyiddin Yassin said today. He hat while the government is concerned about public safety and is watching developments in Japan, he remained confident that Malaysia would “implement what is the best” for the country. The deputy prime minister stressed that the government would learn from Japan to ensure public safety. “I think it is something which every country in the world is taking note of, what is happening in Japan. There are many things that we can learn but what is important is the safety of the country and the people. “In this matter, we have an agency that is responsible and they know what they are doing and we are confident that they will implement what is the best,” he told reporters during a press conference today. Energy, Green Technology and Water Minister Datuk Peter Chin had also said that the “government will not do it secretly without informing the public”. Chin added that the Malaysia Nuclear Power Corporation had opened a tender to international consultants to conduct a study on the location, suitability and safety of the location, type of technology and public acceptance of the proposal. However, MCA president Datuk Seri Dr Chua Soi Lek yesterday had called on the government to reconsider building a nuclear plant following the explosions to nuclear reactors in Japan after the March 11 earthquake and tsunami that devastated the country. He said the government must re-evaluate nuclear power in the country.